The present work is a study for one of John's most famous paintings, his monumental Portrait of Madame Suggia, 1921-23 (Tate Britain; see M. Easton and M. Holroyd, The Art of Augustus John, London, 1974, pl. 20). 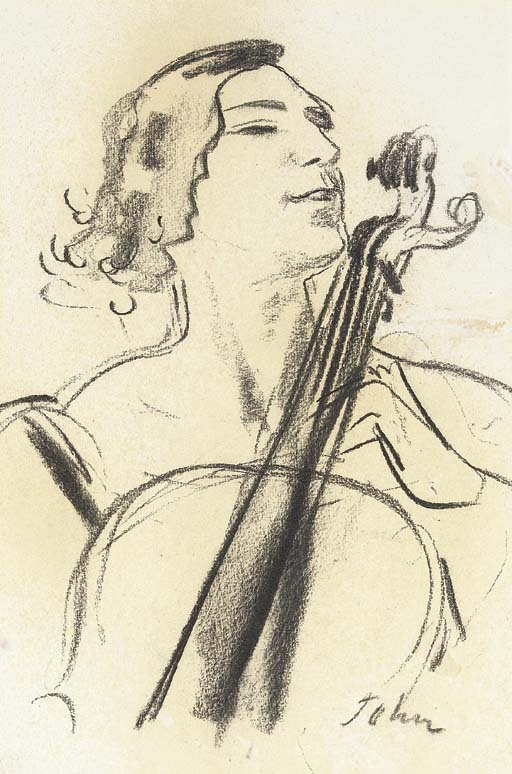 The drawing is closely related to the artist's first version of the portrait, circa 1920 (National Museum of Wales, Cardiff; see Portraits by Augustus John, catalogue for the National Museum of Wales exhibition, Cardiff, 1988, pl. 33) which was discarded in favour of a larger canvas. The celebrated Portuguese cellist, Guilhermina Suggia (1888-1950) resided in London between 1912 and 1923, where her performances reputedly lifted audiences into a state of ecstasy. Commissioned by the newspaper owner Edward Hulton, the portrait was intended to be a betrothal offering for Suggia, to whom Hulton was briefly engaged. When the engagement ended John was already committed to the painting which took around two years and almost eighty sittings to complete. Suggia's visits to the artist's Mallord Street studio in Chelsea were in fact so frequent that they were rumoured to be living together. The sitter recalled, 'To be painted by Augustus John is no ordinary experience ... the man is unique and so are his methods ... I played Bach, chiefly because, being classical music, it suited the attitude required by the artist ... I strained all my powers to keep at just the correct attitude. In a picture painted like this, a portrait not only of a musician but of her instrument - more of the very spirit of the music itself - the sitter must to a great extent share in its creation. John himself is kind enough to call it 'our picture'' (G. Suggia, 'Sitting for Augustus John', Weekly Dispatch, 8 April 1928).